Be the first from your town or community to gaze upon these exotic treasures of the Far East. Grown wild along the banks of the Yangtze in untrodden jungles stalked by shrieking bats and fire-eyed beasts, the pine apple was for centuries believed to be a fiction from the pages of myth. An exquisite, honeyed rarity, it was said to be enjoyed only by the mightiest Mongol rulers, with a taste as sublimely nectarous as the sweat of God. Marco Polo himself was believed to have acquired one of these fabled orbs, only to have it poached away by dagger-wielding bandits—a trauma that would leave him stricken with madness for the rest of his days. But now, you—yes, you!—have the extraordinary chance to pay audience to the succulent gems that eluded the great and cunning travelers of yore. Here it is, in all its majestic splendor: the pine apple! Bear witness to this sensational specimen! Ornately plated with a barbed husk, the pine apple is handsomely equipped to foil its gravest enemies, from the mealybug to the croco-dile to the starving vagabond who lusts for its candied sap. Only the strongest metals devised by modern man can penetrate its thorny cask. Marvel at its flamboyant waxen top-fronds, which blossom skyward in salute to their Creator. With its fierce countenance of a pagan idol, it is easy to be frightened by the pine apple’s appearance. But fear not! These terrific ovals harbor no evil. Peer upon the magnificent interlocking helices of its wet, yellow meat. Stripped of its serrated bark, the pine apple yields to the teeth like a tender bullock’s heart, eliciting squeals of merriment from sugar-keen moppets. They love the musky fragrance! Ah, it is the pine apple’s delectable bone, which runs northwise through the toothsome guts and lends each specimen its impressive posture. The bone is referred to as the “gambler’s loaf” by Oriental sorcerers, as any man who dines on its sturdy, mineral-rich flesh is rewarded with good fortune. It is the savory flavor of luck! The broth of the pine apple is sickly sweet and hinted with rot, a beverage of eye-stinging pungence that should be immediately poured into the waste receptacle. To convey the pine apple’s spectacular proportions, here is one positioned next to the head of a woman for comparison. It is truly the largest food there is! Have you ever in your life beheld such an astoundingly spiny meal? How mesmerizing! 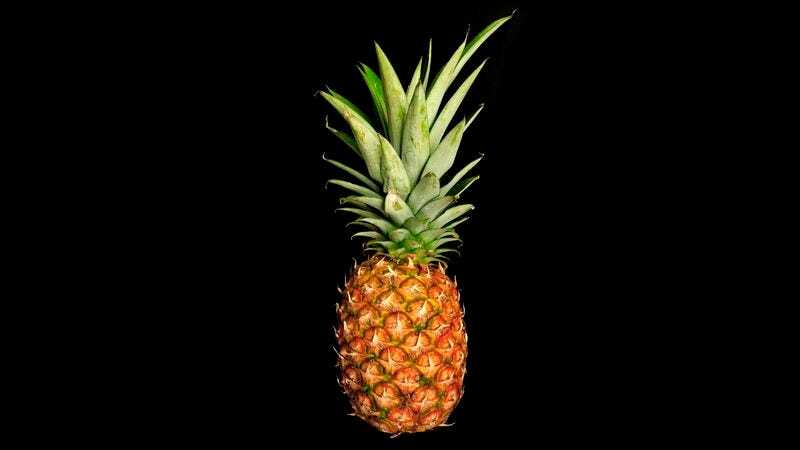 Surely, all men can admire the great wonder that is the pine apple.